ARLIS/NA Multimedia & Technology Reviews Needs You! ARLIS/NA Multimedia & Technology Reviews Co-editors are seeking volunteers to author reviews for the August 2015 issue. ARLIS/NA Multimedia & Technology Reviews connects readers with new technologies and the multimedia landscape. Reviews will target projects, products, events, and issues within the broad realm of multimedia and technology related to arts scholarship, research, and librarianship. To volunteer, choose your review topic from the list below and complete our review form by Friday, June 12, 2015. We seek reviewers for the following resources. The snippets are taken from the resource’s web page and are not necessarily the opinions of the M&T Reviews Co-Editors. The editors of the M&T Reviews are happy to answer questions about any of these selections so feel free to contact them (arlisna.mtr@gmail.com). The submission deadline for reviews is Friday, July 3, 2015. "Six acclaimed filmmakers bring their own visual style and artistic approach to the exploration of six different landmark buildings, showing us how they reflect our culture and guard our collective memory. The buildings featured are the Berlin Philharmonic Hall, the National Library of Russia, Halden Prison, the Salk Institute, the Oslo Opera House, the Centre Pompidou." NB: Free access will be provided to the reviewer. "CyArk was founded in 2003 to ensure heritage sites are available to future generations, while making them uniquely accessible today...with the mission of using new technologies to create a free, 3D online library of the world's cultural heritage sites before they are lost to natural disasters, destroyed by human aggression or ravaged by the passage of time." "Premier marketplace for the exchange of landscape services, products, resources, & connections." "This website...is unprecedented in its functionality, providing virtual access to the objects in exceptional depth, along with wide-ranging scholarship on the photographs’ historical context and significance." "UnderConsideration has launched six sites—Speak Up, Brand New, Quipsologies, The Design Encyclopedia, Word It, and FPO—that have been part of the growing dialog in design and the broad appreciation of the practice made possible by the reach of the web." The Journal of Business & Finance Librarianship is looking for book reviewers for future issues. Books reviewed are related to subject areas within business. Although there is a major focus on reference materials, review also address significant academic business books that have recently been published. Each review analyzes the purpose of the book and the success of the author or publisher in fulfilling that purpose, along with information on the scope, content and organization of the source. In your message, please indicate your areas of expertise or interest (such as finance, marketing, or specific industries, etc.) and include your mailing address. The Journal of Business & Finance Librarianship is an innovative quarterly journal that provides you with useful articles about the creation, organization, dissemination, retrieval, and use of business information. This refereed journal covers the business information needs of special libraries, academic libraries, and public libraries, as well as information services and centers outside of the traditional library setting. You'll find that the journal is international in scope, reflecting the multinational and international scope of the business community today. The immediate focus of the journal is practice-oriented articles, but it also provides an outlet for new empirical studies on business librarianship and business information. Aside from articles, this journal offers valuable statistical and meeting reports, literature and media reviews, Web site reviews, and interviews. Join us as a presenter at the upcoming retreat! Proposals are now being accepted for break-out sessions. Please see the specific proposal guidelines and retreat theme below. The summer teaching retreat was created to build community amongst instruction librarians and library school students. The retreat provides unique and practical presentations. Participants have opportunities to share teaching experiences, ideas, and resources during lively break-out sessions as the practices and innovative ideas of librarians are discovered. Ideally, participants leave the retreat with a larger network of resources and contacts, as well as inspiration to creatively expand their library instruction repertoire. Attendees of past retreats included librarians from academic, public, school, and special libraries. Approximately one-third of the attendees were MLIS students. Our 2015 theme is creativity. The following questions may help you generate ideas for a proposal: How do you bring creativity to the library and teaching? What creative strategies do you use in the classroom? What aspects of creativity in your personal life do you bring into your role as an educator? If you are a writer, musician, painter, or other type of artist, what aspects of your creative life influence your teaching? Break-out sessions are intimate small-group discussions of approximately 15 or less individuals. Proposals should be related in some aspect to teaching and tied to the 2015 theme of creativity. Proposals must be 250 words or less. Proposals are due Monday, June 15, 2015, by 11:59 p.m. Applicants will be notified by Friday, June 19, 2015. Please visit http://goo.gl/forms/KrOco4KHUY to be directed to our online submission form. Please contact knight_annie@sac.edu or russo_stacy@sac.edu with any questions. The LITA UX IG is also seeking the suggestions for discussion topics, things you have been working on, plan to work, or want to work on in terms of UX/Usability. All suggestions and presentation topics are welcome and will be given consideration for presentation and discussion. At the meeting, we will also take volunteers who will moderate the UX Twitter Chat by the LITA UX IG and Weave and/or who are interested in participating into organizing more meetings for the UX IG. Please submit your topic below in the comments section of the CFP post in ALA Connect (http://connect.ala.org/node/239292) and also e-mail us off-the-list. Please add your thoughts and ideas in the comments! Feminist pedagogy employs strategies such as collaborative learning, valuing experiential knowledge, employing consciousness-raising about sexism and other forms of oppression, and destabilizing the power hierarchies of the traditional classroom. Ultimately, feminist library instruction seeks to empower learners to be both critical thinkers and critical actors who are motivated and prepared to bring about social change. The concept of feminist pedagogy has recently energized current conversations on library instruction, so it is fitting and timely to consider how feminism might intersect with another vital student-centered service the academic library provides: the reference desk. Inspired by the ideas, possibilities, and discussions set in motion by Maria T. Accardi’s Feminist Pedagogy for Library Instruction (2013), this edited collection continues these conversations by considering how feminist strategies and philosophies might reshape, invigorate, and critique approaches to reference services. In short, this collection will provide critical and thought-provoking explorations of how academic librarians might rethink central reference concepts and services, from the reference interview, to the reference collection, to the staffing of the reference desk itself, from a feminist perspective. In what ways can a feminist ethic of care revitalize or transform the reference interview? How might a feminist critique challenge the language we use to describe reference work, such as the “interview” and the "transaction"? How might a feminist approach guide policies for developing, weeding, or completely discarding reference collections? Can a feminist lens help influence principles for reference staffing, from the tiered Brandeis model to the librarians-only staffed desk to complete disintermediation—no desk at all? How might feminist approaches help us reconsider the delivery methods of reference services—face to face, virtual, and telephone? What about the notion of the neutral reference librarian—is such a thing even possible from a feminist perspective? Can intersectional feminist strategies in LIS programs help influence a new generation of librarians who incorporate anti-racist and queer approaches in their reference practices? Can a feminist reference desk help thwart the insidious encroachment of neoliberalism in the academic library? These guiding questions propose to stimulate a series of conversations about the possibilities of a feminist reference desk—the literal desk, and the multifarious metaphors it represents. This volume will contain essays (~1500-5000 words) that examine the ways in which feminism might critique and reshape academic library reference work. Essays that are straightforward scholarship are invited and welcome, as are more hybrid approaches that incorporate scholarly writing with personal narrative or other strategies consistent with feminist methodologies. Proposals should contain 1) an abstract of no more than 500 words describing the proposed contribution and 2) a short biographical statement about the author(s). Submit proposals to maccardi@gmail.com. About the Editor: Maria T. Accardi is the author of Feminist Pedagogy for Library Instruction (2013), for which she received the 2014 ACRL WGSS Significant Achievement Award, and a co-editor of Critical Library Instruction: Theories and Methods (2010). She is Associate Librarian and Coordinator of Instruction and Reference at Indiana University Southeast in New Albany, Indiana. CFP: New Review of Academic Librarianship - Special issue on "Academic Librarians as Communicators"
Call for Papers: New Review of Academic Librarianship - Special issue on "Academic Librarians as Communicators"
The New Review of Academic Librarianship is an international journal that publishes reviews, research, critiques and exemplar case studies on substantive topics relevant to those providing library and information services to academic communities. Please submit an abstract of no more than 500 words describing what your paper will include to Guest Editor, Helen Fallon (helen.b.fallon@nuim.ie) no later than 19 June 2015. For all proposed authors include name, institutional address, telephone number, and email address. People will be notified by the 14th July 2015as to whether their abstract has been accepted or not to be taken forward as a full paper. 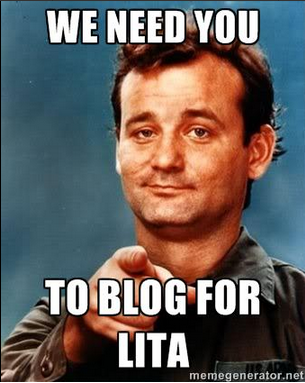 The LITA blog is seeking regular contributors interested in writing easily digestible, thought-provoking blog posts that are fun to read (and hopefully to write!). The blog showcases innovative ideas and projects happening in the library technology world, so there is a lot of room for contributor creativity. Possible post formats could include interviews, how-tos, hacks, and beyond. Any LITA member is welcome to apply. Library students and members of underrepresented groups are particularly encouraged to apply. Contributors will be expected to write one post per month. Writers will also participate in peer editing and conversation with other writers – nothing too serious, just be ready to share your ideas and give feedback on others’ ideas. Writers should expect a time commitment of 1-3 hours per month. Not ready to become a regular writer but you’d like to contribute at some point? Just indicate in your message to me that you’d like to be considered as a guest contributor instead. Send any and all questions my way! You are invited to send me the topics you would like to discuss at the ALCTS Collection Development Issues for Practitioners IG meeting at the 2015 ALA Annual Conference. Collection Development Issues for Practitioners IG is formed to make sure that the issues you are concerned about being addressed. Sherri and I will select and consolidate three primary topics to be discussed at the meeting. This IG meeting is going to be heldon Saturday, June 2015 from 1 to 2:30 PM at Hilton San Francisco Union Square room 19 &20. Editors of the forthcoming ACRL publications book The small or rural academic library: Leveraging resources, overcoming limitations, to be published mid-2016, seek proposals for chapters from librarians who have identified and met the challenges unique to the small and/or rural academic library. The book will provide a practical overview of academic library programs, policies, managerial, technological, and professional engagement concerns within small academic libraries (FTE <500 - 2,999) or academic libraries in ural environments (population of 50,000 or less). Chapters are sought about tactics for and experiences of identifying and remedying these challenges. Submission Procedure: Proposal Submission Deadline is June 15th, 2015. Academic library professionals working in small or rural libraries are invited to submit their proposal of not more than 3 pages, double-spaced. Your proposal should include: 1) the names and contact information for all authors (please identify a main contact); 2) a clear, concise description of the topic you are proposing for a potential chapter; 3) why the topic may be of interest to small/rural academic librarians; 4) information about the author(s) showing his/her qualifications for writing the chapter, and 5) a brief biographical sketch of each contributing author. Submissions should be in Microsoft Word. Authors of accepted proposals will be notified by July 1, 2015. If the book proposal is accepted, each chapter will be expected to be about 4,000 - 5,000 words. The 7th Conference on Open Access Scholarly Publishing (COASP) will be held this year in the Trippenhuis at The Royal Netherlands Academy of Arts and Sciences (KNAW) in Amsterdam, September 15th-17th, 2015. The Program Committee have set aside one of the sessions within the conference program as a Show & Tell opportunity for showcasing exciting new products, projects, ideas or initiatives relating to open access publishing as this proved to be such a success last year. Six slots are available and organisations are invited to submit a proposal to us for a 10 minute presentation. All proposals should be submitted by 31 May 2015 at the latest to: info@oaspa.org. The Program Committee will then review the suggestions and make a final decision by the end of June. If you aren’t selected for a Show and Tell then there may be an opportunity for you to present a poster on your topic at the conference. Please note that while we will be able to cover the registration costs for the authors of successful proposals, we are not able to cover any of the travel expenses that may be incurred in attending the conference. Further announcements will be made shortly when registrations for the event are open and the preliminary program is available. Keep up to date via our blog http://oaspa.org/blog/ or sign up for announcements by email at http://oaspa.org/conference/. UKSG is running a joint call for papers for (a) the 2016 Annual Conference (11-13 April, Bournemouth, UK) and (b) the 2015 Forum (18 November, London, UK; this is the day after the UKSG One-Day Conference, although please note that the programme for the latter event is separately planned and there is no call for papers). The conference attracts almost 1,000 delegates of a similarly wide-ranging global provenance. It provides a much respected forum for discussing trends, showcasing initiatives, finding out about current practice across sectors, and connecting with other professionals. The deadline for suggestions is Friday 5 June 2015. If you are interested in submitting an article, this journal uses ScholarOne Manuscripts to peer review manuscript submissions. Please read the “Guide for ScholarOne Authors” at http://journalauthors.tandf.co.uk/submission/ScholarOne.asp before making a submission. Complete guidelines for preparing and submitting your manuscript to this journal are provided at http://www.informaworld.com/openurl?genre=journal&issn=1533-290X. WLIS receives all manuscript submissions electronically via their ScholarOne Manuscripts website located at: http://mc.manuscriptcentral.com/WLIS. ScholarOne Manuscripts allows for rapid submission of original and revised manuscripts, as well as facilitating the review process and internal communication between authors, editors and reviewers via a web-based platform. ScholarOne Manuscripts technical support can be accessed via http://scholarone.com/services/support/. Inquiries and questions are welcome and can be sent directly to the editor, Jodi Poe, at jpoe@jsu.edu. Please note: We accept manuscript submissions through the year; however, the deadline to have your article appear in our next issue, if accepted, is August 3, 2015. Accepted and approved manuscripts received after this date have no guarantee of being included in the next published issue. The ACRL Technical Services Interest Group focuses on the special needs and interests of all technical services workers in academic libraries. We are looking for speakers to present in a lightning round format at the ALA Conference in San Francisco on Saturday, June 27,2015 from 4:30 – 5:30 pm. Presentations should be no more than 5 minutes long. We will notify you by Monday, June 1, if your presentation has been selected. The Northeast Popular/American Culture Association (NEPCA) is seeking paper proposals on the topic of Storytelling: Constructing Oral and Written Narratives for its fall conference to be held at Colby-Sawyer College in New London, NH the weekend of October 30-31. Please send 250-word electronic versions of your proposal to Adam Crowley at crowleya@husson.edu and to Kraig Larkin at Kraig.Larkin@colby-sawyer.edu. Include a two or three sentence description of yourself, your background, and your qualifications. Please use the official form found on the NEPCA website under the “Fall Conference” tab. Send your proposal to Adam Crowley at crowleya@husson.edu and to Kraig Larkin at Kraig.Larkin@colby-sawyer.edu. NEPCA presentations are generally 15-20 minutes in length and may be delivered either formally or informally. NEPCA prides itself on holding conferences which emphasize sharing ideas in a non-competitive and supportive environment involving graduate students, junior faculty, and senior scholars. Interested in seeing your name in print? Want to add another line to your c.v.? Have something to share with other business librarians? The Business Reference in Academic Libraries Committee of BRASS is seeking articles for the next issue of its online publication Academic BRASS. Academic BRASS is a newsletter--not a journal--that publishes issue-based articles and information for the general and educational interest of BRASS members and academic business librarians. Topics of interest to the editors are pedagogy and business librarians, teaching business literacy in the wake of the financial crisis and resources for entrepreneurship. Book and database reviews are always welcome as well. Maybe you have another cool idea – that’s fine too – get those submissions in! You may want to see previous editions of BRASS. NOTE: its a bit off topic - but a good call to share. Abstracts of up to 250 words are being solicited for Vol. 8, Issue 1 of The Foundation Review. This issue will be an open (unthemed) issue. Papers on any topic relevant to organized philanthropy are invited. Submit abstracts to submissions@foundationreview.org by May 15, 2015. If a full paper is invited, it will be due Sept. 30, 2015 for consideration for publication in March 2016. For more information please go to the Call for Papers on our website. The recently released issue on Philanthropy Consulting was developed in partnership with the National Network of Consultants to Grantmakers. We invite you to read this open access issue, courtesy of the authors and their organizations, and view the article introductory videos. Librarians can be a driving force in implementing Project-Based Learning through guided inquiry in secondary (9-12) classrooms. This book would appeal to librarians wanting to engage with teachers, curriculum directors, or administrators, or develop their own curriculum, and the chapter contributions will help to define and describe Project-Based Learning, identify research and resources that support Project-Based Learning across disciplines through a guided-inquiry model. Additionally, librarians and educators will discover methods and methods for project and time managements, resources, and collaborations that are needed to implement a Project-Based Learning unit. Project-Based Learning is most successful when it employs inquiry-based strategies and use resources to help students stay engaged in the learning process through authentic tasks, making community connections, and recognizing and rewarding their strengths, through information literacy, metaliteracy, and critical inquiry skills to meet the needs for the 21st century learner. Readers will also discover resources to plan, strategize, implement, and assess PBL in secondary and higher education, including multidisciplinary, STEM, advanced placement or honors-level, learning communities, capstone, and portfolio examples of projects. Please feel free to share with your colleagues. The Office for Intellectual Freedom (OIF), of the American Library Association (ALA), is seeking bloggers! Each person will submit original content for one week every other month for a total of 6 weeks a year. Guest bloggers can be recruited for your assigned week. Minimum of 3-5 posts during your assigned week but there is no maximum. The sky’s the limit. Each post will be vetted by OIF staff. The editorial board will be composed of ALA members but guest bloggers can be recruited from other relevant connections. We’d like to be creative with the variety of post ideas. Priority is given to TIMELY CURRENT RELEVANT news. Our goal is to inform in an engaging yet amusing way. Think “shareable”. We’ll compose a one-year schedule. Weeks can be traded by individuals. Posts can be written and submitted in advance. We’re asking for a one-year commitment. Ideas: interviews, infographics, historical essays, book reviews, celebration weeks, international reach, anniversaries, programming ideas, tips, policies, frontline experiences, , skill development, question and answers, technology, state chapters, community engagement, trends, best practices, etc.